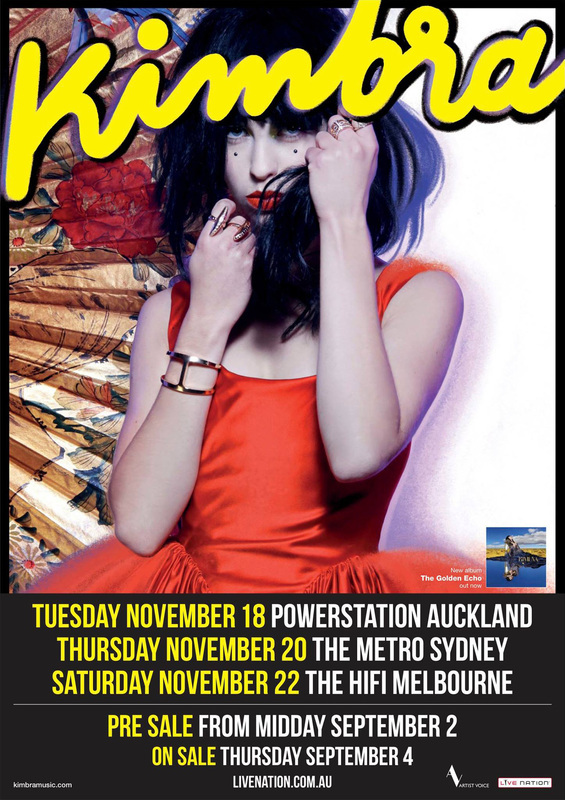 New Zealand’s leading lady, Kimbra, is set to bring her signature electric and powerful performances to the stage for a trio of shows this November. Embarking on a mid-October US tour which includes a sold out show at Hollywood’s iconic Roxy Theatre, the ever-stylish singer-songwriter, Kimbra, returns to Australia and her native New Zealand in support of her brand new album, The Golden Echo, playing Auckland’s Powerstation, Sydney’s Metro Theatre and Melbourne’s Hi-Fi. Winner of the ARIA Award for Best Female Artist for two years in succession, as well as five Tui awards at the New Zealand Music Awards, last week Kimbra offered her highly-anticipated sophomore album, The Golden Echo, which shot into in the ARIA and RIANZ charts at #5 this week. The Golden Echo, featuring singles 90’s Music and Miracle, was co-produced by Kimbra and Rich Costey and the wonderful kaleidoscope of collaborators include members of the Mars Volta, Muse, Foster the People and Daniel Johns of Silverchair. My Live Nation members pre-sale starts 12pm Tue 2nd Sept. General public tickets go on sale at 10am Thu 4th Sept.